“With background and character as rich as the writing of [John] Le Carré, Double Crossing adds plot and pacing that defy the reader to put it down. “Once in a while, a novel of compelling power thrusts its way to the surface. 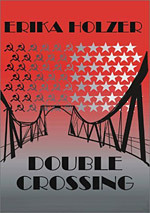 Erika Holzer’s Double Crossing is such a novel. What lifts it far above the standard espionage thriller takes more than crisp storytelling. “The author subtly dramatizes ideas in a different, near-visceral way. As Holzer examines values and conflicting ideologies in each wrenching plot twist, the story builds to a nearly unbearable pressure-point of tension. “Novels and films designed to reach the masses and the American intellectual community have taken a dramatic turn to the Left,” says the author of this exciting suspense novel, Double Crossing (Putnam). “"People on the Right," she adds, "have complained about this, have analyzed the bias. But they have not understood that we on the Right should generate ‘entertainments’ with our own compelling message." “Erika Holzer has done exactly that with what she calls her “human rights” espionage novel. She has written a powerful anticommunist story — with one of the most ingenious plots of any mystery story ever written. Once you begin reading this novel, you won't be able to put it down until the last exciting page. “And you won’t find a word or an incident to offend a reader of any age. Glienicker Bridge, which figures prominently in this novel, was marked for destruction by the Nazis during the closing days of World War II — as were all bridges leading to Berlin. Only Glienicker survived their explosives, but it was badly damaged. Later it was repaired, but not in time for the Potsdam Conference in July of 1945. A temporary pontoon (floating) bridge had to be used by President Truman and other representatives of the Western powers to cross the Havel River that separates Berlin from Potsdam. That American GIs were detailed to work on the bridge repairs in 1945 is fact. That Russian soldiers were detailed to assist them may or may not be fiction. But given the temper of the times — the spirit of cooperation that the West was avidly pursuing with the Soviet Union immediately after the war — it is plausible. That such cooperative efforts between the GIs and their Russian counterparts may have culminated in a "Freedom Bridge" dedication ceremony is possible. The idea, dramatized in this novel, was sparked by lawyer James Donovan's terse reference above to a "Bridge of Freedom" — a characterization of what may have happened at Glienicker that proved impossible either to verify or to disprove. Paul Houston, American diplomat, walked — reluctantly — into a palace he hadn't seen since his foreign correspondent days over thirty years ago. Cecelienhof Palace in Postdam, East Germany. Site of the Potsdam Conference after the war. Site of another conference in — Houston checked his watch. Less than an hour. What the hell, he thought as he tracked the overhead noise up some stairs. This was the age of sequels, wasn't it? If they get away with it in the movies, why not in diplomatic circles? The pre-conference cocktail hour was in noisy full swing. Moscow red, transported ad nauseam to Potsdam.... Red walls, red gilt-trimmed chairs like the ones in the conference room downstairs, red tablecloth on a sumptuous buffet table. Clusters of solicitous Russian waiters were serving drinks. Clusters of solicitous delegates — the Americans and British — hovered about the Soviet delegation.